Colin Baker is the Doctor in 100. The Doctor and Evelyn arrive in Rome, 101 BC, approximately, October. They meet a young lady of 19, Aurelia. She mentions her husband – Julius Caesar. Evelyn is excited, but her excitement soon turns to confusion. Surely you can’t heal a wound in time with just a bit of sticking plaster? Wolfgang Amadeus Mozart. Born in 1756, a veritable wunderkind – playing music for the crowned heads of Europe as an infant, composing by the time he was five years old. But it’s tempting to wonder whether his amazing longevity has overshadowed his creative genius – would Mozart’s music be better respected, maybe, if he’d died as a young man? Would he be a legend of music, rather than of scientific curiosity, if he’d never lived to compose the film score for the remake of The Italian Job? Someone has assassinated the Doctor. And he only has 100 days to find out who did it. 100 is a bit meta, a bit farcical, and a bit self-indulgent. As Big Finish’s one-hundredth main range for Doctor Who, I’m willing to overlook those flaws. 100 is a story that not only celebrates Big Finish’s time with the show’s license, but also pays homage to perhaps its most popular pairing of the Sixth Doctor and Evelyn Smythe through four stories. 100 is by no means a classic story or a mandatory one. It’s best described as a piece of fun and harmless fluff. 100 BC finds the Doctor and Evelyn present in Republican Rome around the time of Julius Caesar’s birth. A chance meeting with Senator Gaius Caesar and his wife turns awkward when the pair discover that they’re interrupting a romantic evening for the couple. But a quick nine-month journey in the TARDIS places the Doctor and Evelyn back at the Senator’s household just in time for the birth of the newest addition to the household. Not Julius Caesar, but Julia Caesar. The Doctor is determined to correct this mistake that their minor meddling cause, but Evelyn had other ideas. After all, Julius Caesar was one of the most influential men in all of history. What if that influence was instead wielded by a woman? Jacqueline Rayner is the creator of Evelyn Smythe, having penned her very first audio, The Marian Conspiracy, in 2000. A veteran writer and editor of vast amounts of Who fiction, Rayner turns 100 BC into an historical farce. The Doctor is determined to keep time on its present course and ensure reality stays in place, but Evelyn is determined to strike a blow for women everywhere by ensure perhaps the most powerful figure in all of Roman history is born as Julia Caesar. As the story is a farce, I’m willing to put aside the fact that Evelyn, after traveling with the Doctor for a long period of time and seeing how important it is to keep history on the right track (especially considering her actions at the end of Arrangements for War), would be so gung-ho on “making history better.” If the listener can make it past that bit of flawed characterization, then they’ll be treated to a quickly moving and funny story where the Doctor and Evelyn consistently try to sabotage and one-up each other in terms of encouraging the Senator and his wife to get on with their amorous activities, with Evelyn faking a heart attack and the Sixth Doctor telling Evelyn he’s a Six “from a horrible future” as the highlight. It’s more “timey-wimey” work from Shearman, but instead of milking it for horror this time out My Own Private Wolfgang goes the other way, with a few uncomfortable moments spaced out between abject farce as Mozart after Mozart arrive on the scene in an attempt to bend history to their will. The reasoning behind all these Mozarts is a unique twist, and what really make the tale are the final minutes where where all the plans of all the various Mozarts (some with the Doctor’s assistance, some with Evelyn’s) turn into a massive pileup of schemes and gambits. This story is simply over-the-top and funny, with John Sessions (the voice of the train’s AI from Mummy on the Orient Express as well as QI and early episodes of Whose Line Is It Anyway voicing multiple Mozarts, each one with a voice just different enough to help the listener tell the difference between them. Bedtime Story is…oh for [BLEEP]’s sake it’s Joseph Lidster. That’s pretty much the only way to sum this story up. A slightly creepy story about multi-generational revenge is completely ruined by the “Lidster Twist” that closes the tale. A family deals with new life by embracing inevitable death, and the Doctor races to stop the family’s “curse.” The story itself is very basic, but well put together, and the twist before “the twist” is to stop the vengeful being is pretty well done. And for the briefest of moments, I truly believed we would finally have a Joseph Lidster story with a happy ending…but the last minute shoots that wish dead in the brainpan. The 100 Days of the Doctor is where 100 goes completely meta and kind of sticks its own head up its arse. The Doctor finds himself poisoned by a intelligent virus, the Texineurons, who have been created to kill the Doctor slowly and painfully over the course of one-hundred days. Desperate to find a cure, the Doctor and Evelyn resolve to find the assassin by visiting all the locations where the Doctor could have been infected. But the TARDIS finds itself a bit confused, and ends up taking the Doctor to places past, present, future, and even beyond. 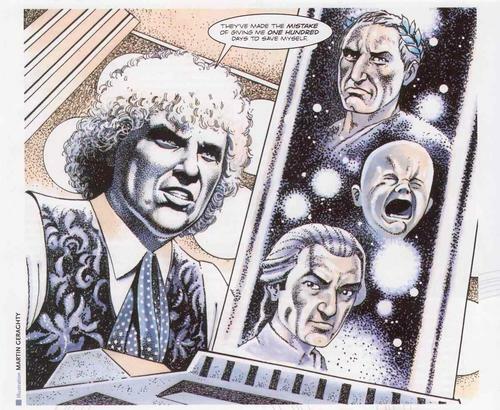 The 100 Days of the Doctor by Paul Cornell is nothing more than Big Finish pulling a Barry Horowitz and patting itself on the back just a bit. The Doctor and Evelyn visit the original incarnations of the TARDIS crew that have been portrayed by Big Finish since The Sirens of Time – so we don’t get Turlough with the Fifth Doctor, but we get Erimem and Peri with the Fifth Doctor, as well as Hex’s time with Seven and Ace, Eight’s travels with Charley and C’rizz (as well as Eight’s initial travels with Lucie Miller, which the Doctor waves off as ‘sometimes one incarnation can meet another), and even the Unbound Doctor portrayed by David Warner and his companion, the Brigadier! There’s plenty of commentary from Evelyn about “the pretty girls” and the Eighth Doctor looking “nice,” and Six of course goes off a bit about “you never who might be listening and how they’re going to react to one’s adventures and companions” (referring to the Time Lords, of course), and in the end the Doctor saves himself by beating up the Assassin…and if I were to tell you the Assassin was played by Nicholas Briggs, would anyone here truly be surprised? 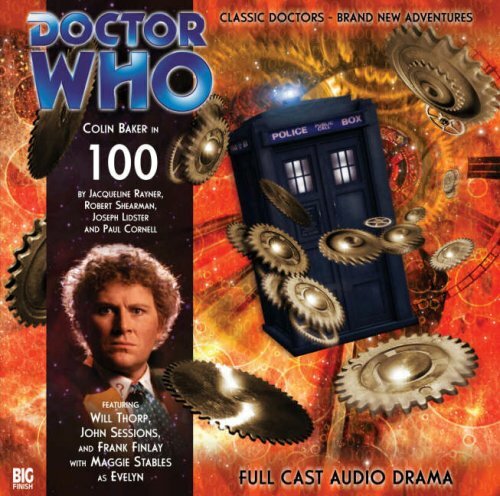 Overall, this collection of stories is all about Colin Baker and Maggie Stables, who serve as the quintessential Big Finish pairing alongside Eight and Charley. 100 has the pair showcase their wonderful chemistry from the ridiculous to the sublime, to the bickering and even to Evelyn almost literally dragging the Doctor along during the last of his 100 days. For a bit, I was finding 100 to be a bit of a weird production choice for Big Finish’s milestone release. I was expecting something a bit more epic, more grandiose, more in line with what Zagreus tried to be. But then I remember the very last episode of The Tonight Show with Johnny Carson. All week leading up to that last Friday night show had been a quiet celebration of his time on the show, with the Thursday night episode with Robin Williams and Bette Midler an all-time classic. But that Friday episode, the very last one, was just Carson sitting on a chair, no guests, no big moments, just him talking about the moments that meant a lot to him. And I think that’s the best way to look at 100. It’s a landmark release, but Big Finish chose to celebrate it by trust four established writers and two actors with great chemistry to their thing. Cobi’s Synopsis – Four stories, two solid, one brilliant, and one written by Joseph Lidster make up a quiet and subdued celebration of 100, Big Finish’s one hundredth main range release. Next up – The Doctor’s sins are catching up with him and the infernal beast Borarus is hungry. Time is running out and Judgement Day is at hand. Paul McGann is the Doctor in…Absolution. This entry was posted in Big Finish Review and tagged Big Finish, Big Finish Audio, Big Finish Review, Colin Baker, Doctor Who, Doctor Who Audio, Doctor Who Review, Evelyn Smythe, Maggie Stables, Sixth Doctor, TARDIS. Bookmark the permalink.